In his three previous best-selling books, Ralph Emery named country radio's Greatest Personality of the Century by Radio and Records-regaled readers with fascinating tales of the business. 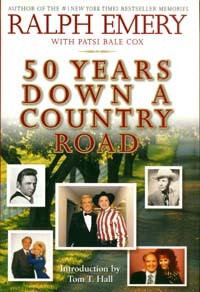 Now, in 50 Years Down a Country Road, stellar figures, including Willie Nelson, Kris Kristofferson, Johnny Cash, Patsy Cline, Tammy Wynette, Tom T Hall, Ronnie Milsap, Reba McEntire, Garth Brooks, Trisha Yearwood, Shania Twain, Faith Hill, and many others, recount the good, bad, and great times of country music during the past five decades. Ralph Emery begins by delving deep into the roots of country through the reminiscences of such luminaries as Eddy Arnold, Tex Ritter, and Tennessee Ernie Ford. He enters the 1950s by examining how the life and death of Hank Williams forever changed Nashville. This decade also launched such stars as Hank Snow, Marty Robbins, Hank Thompson, Carl Smith, Jim Reeves, and Kitty Wells. Emery brings back the 1960s -when writer artists such as Willie Nelson, Don Gibson, Roger Miller, and Johnny Cash proved that Nashville was truly Music City USA. He examines the colorful and contradictory Patsy Cline, the most influential woman in country's history. He talks with Bobby Bare, who set the stage for the '70s outlaws by taking control of his recording in the '60s. In the 1970s, Kris Kristofferson came to Nashville and revolutionized songwriting. Tom T Hall's compositions became the standard to which all "three-minute movie" songs would be held. Mel Tillis, Charley Pride, and Ronnie Milsap succeeded despite incredible odds. America fell in love with George Jones and Tammy Wynette and were brokenhearted when they became yet another divorce statistic. In the 1980s, the pop-country sound rocketed stars such as Anne Murray, Kenny Rogers, and Alabama to the top of the charts. Emery discusses three Of country's biggest female superstars, Dolly Parton, Barbara Mandrell, and Reba McEntire, as well as the traditionalist revival led by George Strait, Ricky Skaggs, and Randy Travis. Finally, he looks back at the past ten years, when phenomenal artists including Garth Brooks, Trisha Yearwood, Shania Twain, and Faith Hill helped sell more records than the country music industry ever dreamed possible. 50 Years Down a Country Road is a must for all country music fans. Ralph Emery began interviewing country music stars at Nashville's powerhouse radio station WSM, winning Country Disc Jockey of the Year six times. He was the host and producer of "The Ralph Emery Show" and hosted Nashville Now for ten years. He is the author of the number one New York Times bestseller "Memories", as well as "More Memories" and "The View From Nashville". He lives in Nashville, Tennessee. A former magazine editor, Patsi Bale Cox collaborated on "Nickel Dreams", the autobiography of Tanya Tucker, and "The View From Nashville" with Ralph Emery, among other publications. She serves on the Grammy nominating committee in the liner note category. She lives in Nashville, Tennessee, and can be contacted at www.pbc-country-books.com.